On yesterday’s episode of SEM Synergy (Yes, yesterday’s. I blame my slipping mind on expired Skittles.) we had a special guest-filled show all about the upcoming issue of Search Engine Marketing Journal. Fear not! Despite the fact I failed to give you advanced warning, you haven’t missed out. The episode will be available on WebmasterRadio.fm and in the SEM Synergy archives very soon! So what do you have to look forward to? Why, we’ve got a special sneak preview of SEMJ with Sean Golliher, founder and publisher of the journal, and Will Martin-Gill, co-author of a paper that will be published in the upcoming issue. The peer-reviewed, semi-annual marketing journal is unique in its high academic standards. The journal also boasts an impressive advisory board and editorial staff, including the likes of Avinash Kaushik, Heather Lutze, Eric Enge and Andy Atkins-Kruger, just to name a few. Sean, Bruce and Susan (both of whom are editors of the journal) explore the making of SEMJ, including where the idea for a research-based industry publication came from, how someone can submit a paper to the journal and plans for the future. 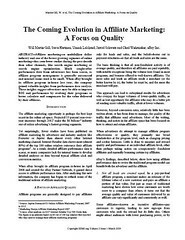 But the real behind-the-scenes deal is my sneak peak of eBay’s paper The Coming Evolution in Affiliate Marketing: A Focus on Quality (pdf). Okay, okay. So it’s not really a sneak peak. You and anyone else can see the paper before the journal is published — and I recommend you jump to it! I interviewed Will Martin-Gill, senior manager of eBay’s affiliate network, to find out more about the research he and his team conducted with the eBay Partner Network. eBay’s affiliate program was first launched in 2001. When eBay took over the network from Commission Junction in May of last year, the new internal team uncovered a slew of previously hidden data. And their most noticeable findings? Not all leads are created equal and the same goes for sales as well. It turned out that a good chunk of their partners were being overpaid for the leads and sales they referred to the merchant, while most of the other partners were being underpaid. With this newfound knowledge, eBay restructured its payment and bonusing model to more appropriately reward efforts by affiliates. The result was that overall costs for eBay decreased, the ROI for eBay increased, and thousands of affiliates now make more than they made before the change. Of course, this is an ideal situation. In a perfect world, everyone is rewarded for the results they achieve. But in our imperfect world, eBay took the necessary steps to improve their system and create a more win-win situation. I’d venture to say this kind of forward thinking isn’t only applicable in the affiliate space. Where else can performance-based payment systems be implemented? Where else can rewards be more fairly distributed? Budgets are getting tighter and everyone is making sure their hard-earned dollars are spent wisely. If we can refocus our efforts to recognize what makes us stronger and what holds us back, some good may come out of this tough time after all.